Growing up, spaghetti meant one thing. Spaghetti strands slathered with a sweetened tomato-based meat sauce that was loaded with sliced red hotdogs. Grated cheese topped the whole thing. For the 7-year-old me, that was spaghetti. At that time, it boggled my brain to find out that spaghetti was JUST a type of pasta. And that it can be sauced by something other than the spaghetti sauce I knew. It was a pleasant discovery that opened my eyes to a world of possibilities. Now, I actually enjoy pasta tossed in something as simple as olive oil, garlic and lemon juice. That’s what’s pictured here, though sprinkled some parmesan cheese atop the hot pasta, and tossed some lightly steamed, shelled shrimps as well. Aside from that, I packed along some yummy baby potatoes, cooked in butter and soy sauce, some tomato wedges and a star-shaped hardboiled egg. While this bento is sadly lacking protein (or at least give me my meat!) the savory baby potatoes provided the nice contrast against the very lightly flavored pasta. Good enough for me! 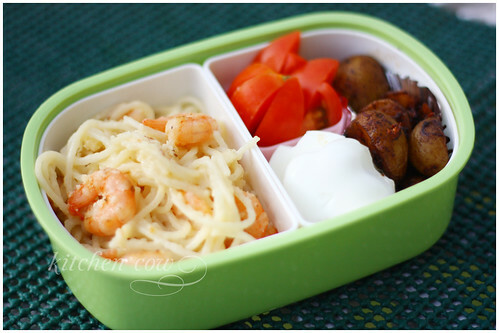 This entry was posted in bento and tagged baby potato, baon, bento, cute egg, hardboiled egg, lunch, molded egg, new potato, obento, packed lunch, pasta, pearl potato, potato, shrimp, spaghetti, tomato. Bookmark the permalink. Hey, it has egg and shrimps – that’s enough protein for me! This is making me hungry. I’m ordering food now! Hnnn…I think it could be done. Try reboiling your salted duck eggs (while still in its shell) until it’s pliable again, then mold. I know some people do this for hardboiled eggs. Maybe it can be done with salted eggs too? Or it might work also if they’re freshly hardboiled salted eggs, like from homemade salted eggs? May I know your recipe for the baby potatoes cooked in butter and soy sauce? It seems delish and I’m really curious. Hi Aubrey! Sorry for the late rep. Let me email you instead. – Melt butter in a pan. Add minced garlic until almost brown but not quite. – Add potatoes and let it fry up a bit. – Finish with soy sauce, then take off the heat. I usually go for a 3:1 proportion, so that’s 1 TBSP butter to 1 tsp soy sauce, depending on how many potatoes. For this particular dish, I use Japanese soy sauce like Kikkoman.